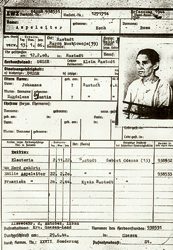 Grossliebental Germans who were resettled in 1940 filled out many records proving their German ethnicity. EWZ stands for Einwanderungszentralstelle or Central Immigration Control department. The EWZ 50 series is most important for GDO research. If your family migrated to Bessarabia or Dobrudscha you will want to check out the Bessarabia resettlement records too. Each EWZ file includes that person's pedigree chart, and sometimes includes personal statistics, a Lebenslauf (life history), citizen application forms, passports, and photos. Visit the Genealogy Database EWZ50 Indices tree for additional information. GRHS has a growing collection of the EWZ 50 & 51 series microfilms. If you find a film in the index, you can view it at the GRHS Library or get help from GRHS research services. If you'd like to help with the project indexing these films, contact Elli Wise at efilou792[@]fewpb.net.